Requeijão Cremoso (Brazilian cream cheese spread)… Yummmm! Just the thought of it makes my mouth water. If you’ve never given it a taste, you’ve just got to try it. Ah, requeijao! Requeijão cremoso (a rough English approximation might be heck-ay-ZHOWN cray-MOH-zoo where the ZH sound is the sound that “s” makes in the word “measure”) is a versatile product! It can be used as a spread on toast, as an ingredient in pasta dishes such as macarronada, in baked rices (arroz de forno) as a substitute for mornay sauce, in casseroles (escondidinhos) as one of the cheese layers, incorporated into stews (morangas), dolloped and stirred into mashed potatoes to make them creamier, as a filling for pão de queijo, and as a companion for serving along with guava paste (Romeo e Julieta), among other uses. Brazilians are crazy for it… and I am sure that you will be, too! (Crazy for requeijao). A white, mild, creamy cheese spread that is similar in both taste and texture to store-bought requeijão cremoso. In a large saucepan, bring 2 liters/quarts of milk to a boil over high heat. Then, turn off the heat and stir in the vinegar. Once curds form, ladle the content of the pan into a strainer placed over a large bowl, wash curds well with running water (to eliminate vinegar sour taste) and press down on the strained curds with a spoon to eliminate any excess liquid. Only curds should be left in the strainer. In a blender, blend together curds, butter, salt, cheese, and 1¼ cup of warm milk for about 2 to 3 minutes on high speed or until mixture is very creamy and smooth. NOTE: For a softer consistency, add a bit more milk. Carefully pour mixture into sterilized and dried glass jar(s) or container(s) with tight lid(s). Store in the refrigerator for at least 4 hours before using as a spread for toast. NOTE: Both the taste and texture of this homemade Brazilian cream cheese are similar to the one sold under the brand Tirolez. STORAGE: It can be stored in the refrigerator for up to 8 days. It can be used in pastas such as macarronada or Brazilian Mac and Cheese, in stews, baked rice (arroz de forno) as a substiture for mornay, in casseroles as one of the layers of cheese, etc. Requeijao cremoso is quick and delicious…Try requeijao and you will fall in love with it. Requeijao is my favorite homemade cream cheese spread. Ah, requeijao! Requeijao is so good! I love requeijao on toast! Previous Post: « 2014 FIFA World Cup Brazil– What You May Not Know! I’ve heard of this, but never had it. It looks great, and so easy to make. Definitely need to add it to my list of stuff! Good post — thanks. Thank you, John! I hope you make this…It is so good! LOL…Shema, I have eaten this by spoonfuls and also on toasts so I do understand you well. Oh Denise just by looking at these beautiful pictures makes my mouth water! This looks so rich and creamy. Thanks, Daniela! I am happy to hear that you liked this! 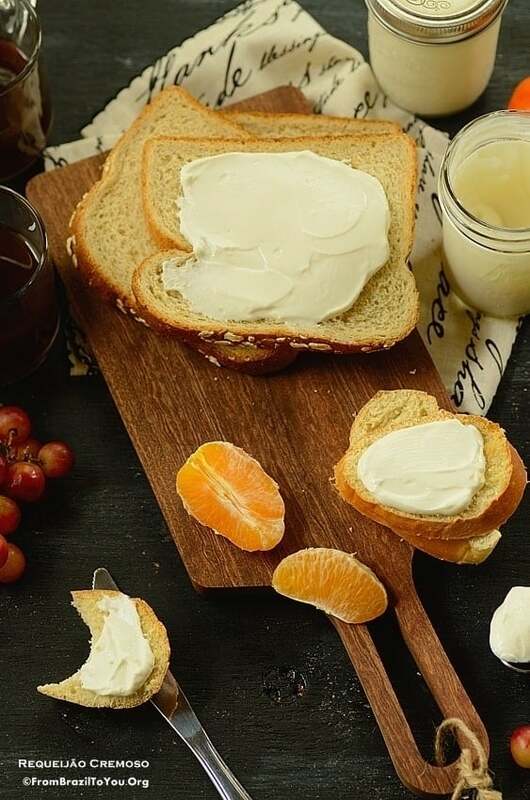 Mmmmm….your Brazilian cream cheese spread looks like a marvelous base for all sorts of appetizers! It sounds divine! Thanks, Liz! This is a very versatile product indeed. Now, if you endorse a recipe for catupiry, I might faint on the spot… I live in constant craving for it..,. I saw a recipe in the net ages ago, long before my blogging days, but never tried it… how about you? I tried a catupiry recipe (solid cheese) once many years ago and liked it. This is one of the recipes that I do intend to post here as well but for now, we have requeijao. 🙂 Thanks so much for stopping by and also for pinning this. Wishing you an awesome day, Sally! I hope you do enjoy it! Once you said Middle Eastern store, I knew what this was and I love it! I always want to buy the cheese from the stores because I grew up eating a version of this but it’s so expensive, not to mention the preservatives. I am so excited to have a recipe now! Yay! It sounds excellent Denise! Didn’t know you can make such a wonderful cream cheese at home! Thank you! Hi, Panos and Mirella! This is quite easy to make and very delicious as well. I hope you try it one day. Have a wonderful day! Denise, your “Requeijão cremoso” looks so incredibly creamy – WOW! Thinking of airing it with guava paste is making my mouth water! Denise, your “Requeijão cremoso” looks so incredibly creamy – WOW! Thinking of airing it with guava paste is making my mouth water!! Thank you, Shashi! I hope you make this and eat with guava paste, a fave of mine. Did you know that Brazilians name the combination of cheese and guava paste Romeo and Juliet? Great recipe and I really love the pictures! Thank you! Hi, Mirtes! Thank you… It is great to hear from you again. Enjoy it! Thanks, Gintare! 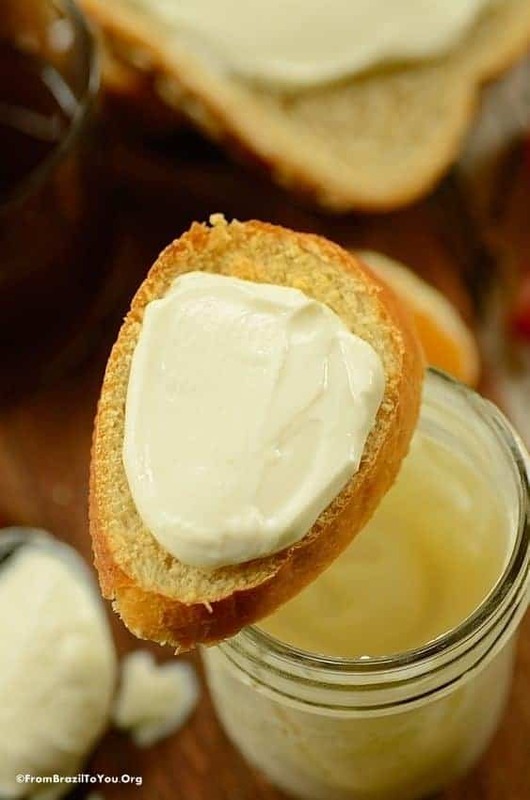 This cream cheese spread is not so easy to find so this recipe is quite handy. Olá, Bruna! Bem-vinda a FBTY! De todas as receitas caseiras de requeijão que já vi (e eu conheço muitas mesmo), essa é a mais parecida em termos de sabor com o que é comercializado. Em termos de textura, não exatamente. Essa receita é sim muito cremosa mas como toda receita caseira falta aquela liga ou puxa e brilho que somente o requeijão comercial tem. Ainda assim, de todas as receitas caseiras é a mais similar pela cremosidade. Como você mesma sabe, há várias marcas de requeijão cremoso no Brasil e ,embora a textura de todas seja bem similar, o gosto varia de uma marca pra outra. Cada marca tem suas próprias características por isso que cada pessoa tem uma marca preferida. Essa é a minha receita e é a primeira vez que compartilho ela aqui. Embora o processo possa ser parecido com alguma que você tenha visto online, as medidas são diferentes. Assim que cabe a você decidir se gostaria de fazer ou não e ver se lhe agrada. Eu particularmente gostei ou jamais compartilharia aqui. Mas o gosto de cada pessoa é diferente. Eu e minha família gostamos muito de requeijão mas não é fácil encontrar aqui no Texas. Quando encontro, acho muito caro e ,em geral, não posso comprar muitos. Assim que, essa receita é uma mão na roda mesmo pra mim e minha família. Um bom fim de semana pra você! 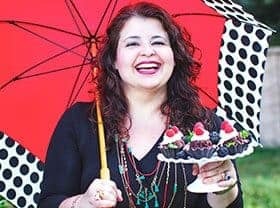 OBRIGADO querida!estou adorando seu blog! Axei qdo estava procurando uma receita de galinhada! Vou tentar fazer sim! As medidas são diferentes mesmo e percebi q tudo no seu blog e muito saboroso:) eu sinto uma falta tremenda de requeijão! 😉 ótimo fds p vc tb!!!! De nada, Bruna! Espero que você possa saborear todos os pratos brasileiros que lhe fazem falta. Um abraço! What a scrumptious new-to-me delight! I’ll bring a loaf of homemade sweet bread to toast if you have a scoop of Brazilian Cream Cheese waiting! Oh my Denise, this is making my mouth water. It looks amazing and how fun that you can make it at home. I love how versatile it is too, blending so well with so many different ingredients! Pinning so I can recreate, thanks! Thanks a lot for both stopping by and sharing it, Chris! I am glad that you made this and enjoyed it a lot, Kumar! You both are always so sweet. Thanks a lot! I’ve never met a Brazilian who is not crazy for requeijão as an American for cream cheese. The problem is imported and quite expensive. This homemade version can be quite handy. My little one devoured this with crackers this afternoon. I hope you get the chance to make it one day. Wishing you a great night! This is so lovely Denise! I’ve never come across this cheese spread before but I am so glad to have discovered it. I might just use it in a dessert…so delicious. Love the way you have paired it with mint and oranges in your pictures…shows how versatile this is. Had an excellent time pronouncing this out loud, at home 🙂 Looks delicious. Might eat it off those spoons ! LOL Thanks, my dear Francesca! This is what I have done many times…eating spoonfuls of it! Oh Denise, I sure miss requeijao…and I never thought in making my own…thanks for this fantastic recipe…looks super delicious! Thanks, Adele! It is my pleasure to share this with y’all. I hope you make it and enjoy…Have a great week ahead! I love cheese, Denise, and if it is the creamy dreamy kind, I can eat them all day long. I make cheese at home for Bangladeshi desserts, but never made for spreads. Thank you for the easy recipe. I’ll definitely try. I hope you have the chance to make this one and enjoy it, Lail! Thanks, Julia! I hope you try this and enjoy! yum! so silky! i gotta try it! i’ve never heard of this. i love creamy things, so i’d love to try it! I hope you do give this a try… It is one of my fave cream cheeses. The good thing about this recipe is made from things everyone has in the pantry and fridge, and much more economical than the store-bought one. Enjoy! Looks good. I like tasting new international foods. Thank you! They can give others a new perspective in food in a very good way! Looks really good. I am not a fan of the thicker cream cheeses as some of them are to hard to spread. Looks like something I would really enjoy. This cheesecake is the filling. It is thin, creamy, and delicate. Hi! I am a requeijao lover and tried the recipe, step by step, but it didn’t come out so well. It has a very sour taste and isn’t creamy at all, actually it’s very liquidy ( I didn’t use up all the 1.25 cps of warm milk either). I wish you could give me any advice on why it came out so sour and so liquidy. And any advise on what to cook with it, I feel sad to throw it out. I usually use vinegar instead of lemon. If you prefer a much less sour taste, place only the curds into a strainer and wash them with running water. Then, press very well to eliminate excess water. Follow the other steps to make the requeijão. I use exactly those measures stated in the recipe and mine always come out creamy after refrigerated for about 4 hours. If you eat it before refrigerated, it won’t be creamy but soft. The recipe asks for 2 quarts of boiling milk. Most of the milk will turn into whey and part will curd. Only the curds are used to make the requeijão. No whey is used. Did you use the whey or only the curds? Did you strain and press well to eliminate excess of liquid? Instead of tossing away the one that you didn’t like, you can use it by mixing with other cheeses such as mozzarella to make it thicker and then, use the mixture as the middle layer for a casserole or use as a sauce (mix with spices) for a seafood pasta. Seafood goes well with acidity. Hi again! I took your advice on using vinager instead of lemon and washing the curd, and straining it very well,and it came out AWESOME!!!!! Thanks a bunch! And by the way, the first batch was used as a chips dip! I am glad the second batch came out great. Using the first one as a dip, it was a smart idea. Have a great week, Dea! Thanks for your feedback. Thanks a lot for stopping by. I am glad that you enjoyed this recipe… What a great review from someone that comes from Minas, land of great cheeses and pão de queijo. My entire family loves it too. It is not always easy to find the store-bough requeijão here in the US so we enjoy this homemade version often. Tenho saudades do brasil. The flavor of your recipe brings back so many memories! My pleasure, LeSha! Wishing you and your family a very Happy, delicious New Year! Thanks for visiting FBTY and try our recipes. Nao vejo a hora de fazer o requeijao!! Amei encontrar este site, ja fiz empadao e foi sucesso absoluto!! Sinto muita falta das comidas do Brasil e com suas receitas ficou tudo mais facil. Sua pagina ja esta marcada nos favoritos!! Muito obrigada! Fico feliz em saber que você gosta das minhas receitas. Se você conhece mais brasileiros na sua área, por favor passe o endereço da página para eles. Um abraço grande e um feliz ano novo pra você e sua família. So excited to find this site! I grew up in São Paulo and have been missing a lot of these Brazilian staples! One question about this recipe: Is it possible to use the curds from cottage cheese in place of boiling milk to make curds? I’m excited to try this out and introduce my wife to requeijão!! Hi, Brandon! Welcome to FBTY! Good question! Theoretically, it would be possible to use the curds from cottage cheese by pressing and draining excess of whey/liquid from them and following the rest of the recipe to make requeijão. But I have to say that I cannot guarantee the flavor will be the same. Probably it won’t! Uso também o nosso leite de saquinho do Brasil, que percebi ser bem mais consistente. Enfim fiz vários testes, até acrescentei uma colher a mais de vinagre, o que deixou nesta vez, quase com gosto de que estaria “azedando”. A textura ficou ótima após refrigerar, mas como eu disse, não encontro este ponto amarelado e mais liso como na sua fotografia. Agora pergunto: Após coagular o leite fervido com o vinagre, você colocou na peneira, escorreu com água para tirar o azedume do vinagre e espremeu bem para retirar o excesso de líquido? Você bateu os coagúlos de leite bem espremidos com o leite morno e também os demais ingredientes em velocidade alta? Vale também lembrar que a medida de cup (copo) que uso daqui é de 240 ml enquanto que a do Brasil (xícara) é de 250 ml. Então se você usou mais leite por causa da diferença de medida, sim o seu ficará um pouco mais mole. Outros brasileiros que moram aqui nos EUA fizeram e deu certo (inclusive uma de Minas Gerais, a terra do requeijão e adorou). Ela escreveu um comentário aí embaixo do post. Adoraria saber porque o seu não ficou como o meu e de outras pessoas. Oi Denise, muito obrigada pelo retorno! De qualquer forma, não ficou ruim, afinal de contas feito em casa, sem amido ou gordura hidrogenada já é uma vitória! Uma coisa interessante que nessa pesquisa sobre requeijão, além de ler sobre a origem, me dei conta que Catupiry é marca kkkkkkkkkk. De nada, Milena! Que pena que não saiu como o meu, bem lisinho. Acredito que a mussarela em tirinhas bem batida no liquidificador com os demais ingredientes até obter uma mistura cremosa e lisinha não deve fazer tanta diferença mas a qualidade do seu leite sim. Aqui uso ou leite de gordura reduzida ou leite integral que é o leite gordo. Das duas formas sai igual embora ache que com o leite gordo sai mais gostoso. Sim o catupiry é uma marca, não é um tipo de queijo não. Essa minha receita tem a consistência e sabor mais parecido com o requeijão da marca Tirolez que amo tanto. Aí no Brasil vocês encontram requeijão como muita facilidade enquanto aqui nos EUA não e ainda assim quando encontramos é bem caro. Já cheguei a pagar de 6 a 8 doláres por um potinho de requeijão o que no câmbio atual seria mais ou menos de 20 a 27 reais por um potinho de requeijão. Assim que faço o meu mesmo em casa. Minha família adora. Usamos para comer com torrada e pra preparar muitos pratos da culinária brasileira. Continue testando com outra qualidade de leite e até mesmo com outro tipo de queijo se você desejar. Sempre bata muito bem batido no liquidificador em alta velocidade por vários minutos (uns 3 ou 4). Um abraço pra você! Dá para usar Whole Milk ao invés de 2%? Bem-vindo, Christiano! Sim, você poderá usar leite integral pra fazer essa receita de requeijão sem problemas. Eu moro em San Antonio. 🙂 Pois é, não muito longe da comunidade brasileira em Austin. Um bom Dia de Ação de Graças pra você e sua família. I was preparing a recipe and it asked for requeijao. I’ve tried two different recipes before, and both went really wrong… I was a bit skeptical about this one, but since I don’t Brazilian Grocery Store nearby, I decided to give this recipe a try, and voila: it turned out delicious! Yes, the consistency is a bit different from the industrialized one, but the taste is pretty similar! In the beginning it was really soft, but after a couple hours in the fridge, it was perfectly creamy. P.s: I had only half gallon of milk at home, so, I cut the whole recipe in half and it worked just fine. Thank you Denise for all the great recipes you share! Isabel: Thanks a lot for your comment. It is great to see a Brazilian here — especially one who knows and appreciates requeijao. It makes me happy to hear how happy you were to try this recipe. I am from Pernambuco but I am crazy for requeijao. Sometimes it is quite hard to find it in San Antonio. This is the recipe that I have been using for a long time. All my family enjoys it. Wishing you a very Merry Christmas and a happy New Year. All store-bought Brazilian cream cheeses (requeijao) present variation both in taste and creaminess. My recipe is more similar — both in taste and texture — to the one from Tirolez brand, not Catupiry brand. And yes, milk should not be disturbed while boiling. Burnt milk won’t make a good requeijao. But I have to say that even if you had followed this recipe as it is step-by-step, you wouldn’t wind up with a requeijao that tastes exactly like Catupiry. From all homemade recipes, this is still the best as you can read from several comments below from people of Minas Gerais, the largest producer of requeijao including Catupiry. The advantage of this recipe is it neither contain hydrogenated fat/preservatives like the ones bought in supermarkets nor cornstarch like some homemade recipes you will find on internet. Sou brasileira e moro no Canadá. Fiquei super feliz de achar sua receita, mas não pude deixar de imaginar qual seria o resultado se ao invés de leite integral usasse o half and half cream. Alguma ideia? Será que funcionaria? Ola, Juliana! Que bom receber a sua visita. Eu nunca fiz requeijao com half and half entao nao saberia dizer se funcionaria tao bem como usar leite mas acredito que nao a presentara grande problema, somente ficara mais consistente por que o half and half contem mais gordura. Tried your recipe this week, awesome. It was the closest result to requeijão cremoso I’ve found so far, it’s my 14th try (13 fails). The only thing is that mine wasn’t as creamy as yours (in the picture) and I think it could use a little bit more of salt (imo). I’ll let you know what happens next time whit a little bit more salt. Btw, it says it serves 2 cups, but for some reason mine was somewhere between 3 (700ml). Weird. I am so glad you enjoyed this recipe. Perhaps the reason why you ended up with more than 2 cups is because yours turned out less creamy than mine. I don’t know why but mine always turns out the same as stated in the recipe. I hope you give it another try. The acid component and accurate temperatures and measurements may determine the result. I don’t put a lot of salt in mine because I am trying to get the taste as similar as the requeijao Tirolez, my favorite. Other brands have different rations of salt and creaminess as well. Looking forward to hear from you again. Have an awesome day! Fiz ontem sua receita. Achei diferente de todas que já tentei e sinceramente a mais parecida. Mas preciso de uma dica: o meu ficou um pouco farinhoso. Você porque? Eu bati por 3 minutos, como indicado, mas tô em duvida se o leite precisava estar mais quente na hora de bater no liquidificador. Tbm adicionei 1/2 copo de queijo cremoso havarti, porque achei que o meu ficou com gosto muito parecido de queijo branco, ou mussarela fresca. A textura no copo, depois de refrigerado eu achei o máximo. Alguma dica? Obrigada pela receita!!! Obrigada, Ana! Sim, o leite bem morno ajuda a dissolver os curds quando batidos no liquidificador e evitar essa textura farinhosa que voce falou. Um abraco!! ai ai ai ai ai! Nossa, que maravilha!! Nunca pensei em encontrar uma receita para requeijão! Vc é um ANJO de pessoa!!! Dorace: Espero que voce goste. Faco todas as vezes que nao encontramos requeijao aqui onde moro. Um abraco!!! I am so glad I found this recipe! After reading it, I immediately went to the kitchen to try it out. I am from Nrazil and love requeijao, but it is very expensive where I live (14 dollars a cup! ), so I HAD to try this. I followed the recipe (sort of). I had full fat milk, so that is what I used. I also divided it in 2, so it would not be a lot of cheese spread for me and hubby. I ised 4 cups of whole milk, used the vinegar, washed the curds for about 5 minutes under running water and then added the butter (I only had salted butter so that is what I used, but I used less salt than your recipe) and instead of milk I added whipping cream. It came out of the blender ready for my toast. It was smooth and creamy and tasted very similar to store bought ones. Thank you so much for sharing this recipe! I will make it every week now. Hi, Christiane! Thank you so much for your feedback. I am so glad you enjoyed this recipe. Adding whipped cream was genius! I have to try it in mine next time. I use requeijao in pastas, on toasts, and everything else that we use it for in Brazil. It is never wasted. I hope you find more recipes here that you would enjoy. Wishing you a very Happy 2019!